← Lost & Found is Found Today! A Celtic Tapestry Is Weaved Today! Eight authors, eight Celtic festivals…all weaved into one tapestry. Welcome to the official release of A CELTIC TAPESTRY! The wheel of the year turns, bringing the joy of spring, the warmth of summer, the richness of autumn, and the merriment of winter. But eight Celtic festivals link these seasons together, bringing with them romance, lust, danger, and even magic. From a city under threat from night-time creatures at Ostara, to a selkie caught by the light of the Lughnasadh moon, to a writer caught in the flames of a fiery goddess at Imbolc. Eight authors have come together to give their own twist on these festivals, weaving each story with a blend of myth, magic, and contemporary telling…to create A Celtic Tapestry. In Nashville, Ostara night is filled with monsters…and only one woman can take them on. Deep in the Irish countryside, a witch takes over as Mother of her coven. Will a ‘wink at the moon’ love spell give her what she most wants? Midsummer celebrations are going as usual for one magical young woman, until she comes into contact with Max Blade–a man from another dimension. Lammas beckons in Ireland in the year 1170, bringing with it war. Will one feisty young woman have to marry the man she hates most, or will the Gods bring her another answer? The woods near Morgan’s home are under threat. But will salvation come for the woods–and himself–in the form of a beautiful environmental officer? A surprising past life regression opens up a new world for one young woman…but it also throws her at the mercy of an unknown Shadow Man. Memphis. The favourite place of a hard working public-relations employee, whose life is good, but without surprise…until she has a chance meeting with James Wellington on Yule night, throwing her world upside-down. A writer, depressed at the turns of his career and losing his relationship with his girlfriend, looks to the Gods for inspiration at Imbolc…and finds the goddess Brigid answers his prayers. And now for the giveaway! Well, what IS the free stuff? Moon Rose Publishing, as part of the A CELTIC TAPESTRY tour, is giving away a ton of good stuff. 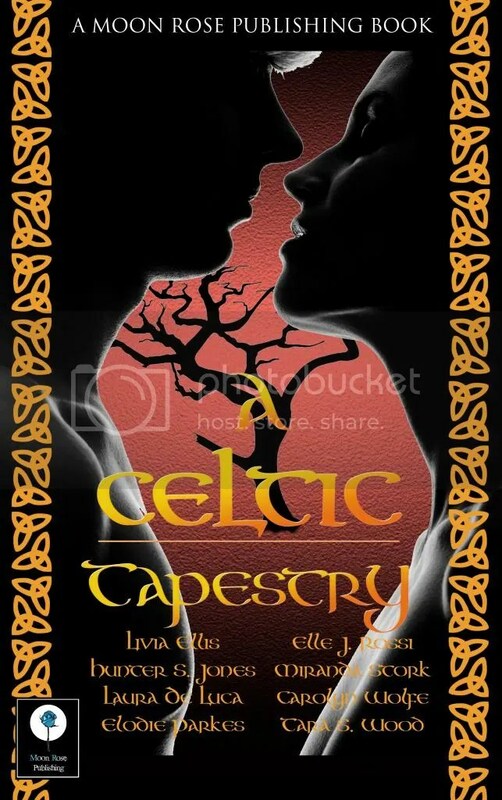 You could win a print copy of A CELTIC TAPESTRY, a sticker pack, bookmarks, a beautiful necklace and jewelled bookmark from Tara S Wood, or an e-book of the anthology! Congrats on your release! I cant wait to read it. For the rafflecopter contest – My favorite season is Autumn. It brings a break from the heat, and a promise of cooler days. What little season changing trees we have in California do their thing and I get to wear a sweater. 😀 Plus – who doesn’t love to buy new scarves? !